Butterfly Lake doesn't bat with the A-listers of the 60's, but for those of us looking for our fix of obscure psych pop, we could do far worse. Goofy lyrics abound flanked by syrupy strings - there isn't really much in the way of edge here. 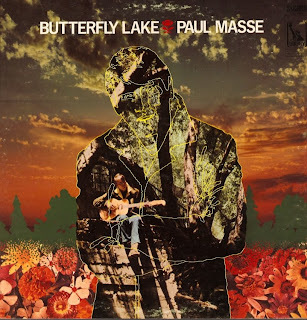 Paul Masse's voice itself isn't really for the ages, but it is pleasant and adds enough dimension to the music to make it interesting. This is music for a breezy, warm Sunday afternoon. The key track by far is the title track. It becomes more than the sum of its parts as it juxtaposes AM radio ready pop with murder ballad lyrics. Even with a few minor chords thrown in, Mr. Masse doesn't sound too despondent about the drowning incident that he's singing about. The strings with happy pop element doesn't really change much over the course of the album. This is more of comfort food music - especially if you're a lobotomized acid eater (sometimes even I don;t know if I'm complementing or criticizing). As a warning, the cheese factor triples after the fifth track, so you might want to stop this one early if you don't have much tolerance for that. The lyrics of "Dream Along" might actually cause vomiting. This album is pretty rigidly front loaded with the better tracks. Side one probably rates a four or slightly under while side two dares to sing about the magic flea. Go ahead and strike the cheese alarm on this one. If you have a stomach for some cheese, however, you'll probably find some pleasures on the first half of this one. That's like 15 minutes of solid, but schmaltzy, psych pop if you're in the market for that. As the trip-o-meter indicates, this is far from the most psychedelic thing you'll hear at the Psychedelic Garage. 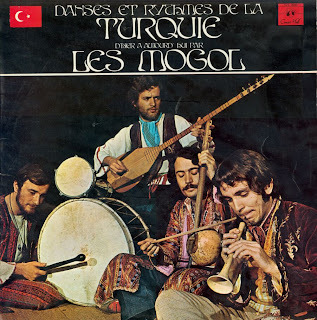 Les Mogol were a group of Turkish string players focused for the most part on the folk styles of their native country. This was the late 60's, however, and these young fellows tried to add a bit of psychedelic flourish to keep up with the times. Unlike typical psychedelic exploitation, it works really well on this album and presents an interesting counterpoint to the more straight ahead stuff. "Lorke," which is the first full song on the album, is about as psychedelic as the album gets with a Turkish melody played on organ glides upon trance-like percussion. It's a pretty cool melding of styles. "Ilgaz" follows with a style more representative of the album. The tune comes across as having roots in Turkish folk, but the structure and instrumentation is a nod toward the San Francisco rock sound. Most of the highlights come closer to the end of the album. "Ziganalar'dan Gecis" fares well by focusing on some of the more exotic string instruments. "Mogol Halay" ups the psych quotient with some fuzzed-out guitar leads and "Cigrik" comes across as a proper psychedelic pop song. The execution is not quite as assured as it could be, and there are some noticible bland stretches on this album, but it's worth a listen or two for the highlight. We practically demand that modern music makes an attempt at genre bending, but this is pretty far ahead of the curve in that respect, and it make Les Mogol historically interesting if nothing else. This album comes to us via the rocky hills of Greece. Although I have no idea how to say their band name, I can say that this is a solid collection of music that needs more exposure. 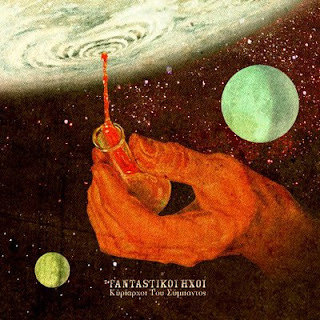 Throughout the span of this double album, Fantastikoi Hxoi sends us careening through shoegazing, metronomic kraut rock, straight-up psychedelia, and what I believe is a touch of Greek folk music. All of this is paired up with some pristine production that rarely sounds cheap and presents very professional sound textures. Texture is paramount here; there is not much in the way of pop song structure, and I see most of these tracks as sound paintings. In all truthfulness, this is one of those double albums that would probably work better as one, but there are plenty of highlights to sink your teeth into. After a short intro, "Aggeloi" presents itself as a quintessential electronic shoegazing track. Also of note on the first disc is the Greek freak folk of "Mayrh Trypta," which eventually devolves (or evolves) into something Manuel Gottsching would have been proud of in the late 70's. "Morka" also stands out as the sort of electro-shoegazing track that Ulrich Schnauss is known for, but once again with an interesting Greek folk twist. The second disc is even better, with less filler hanging around. "Pyramida" makes an nod to lounge music while maintaining a Neu-worthy beat, while "H Palia Edem" entertains with some groovy percussion and oddly-reverbed chanting vocals. The closing track even inches towards a J-pop (as in Japanese) happiness while an 80's synth riff drives it on. This may not be the best music you'll hear this year, but it will definitely rank at the top of your unsigned band lists. There are plenty of styles on Fantastikoi Hxoi's palette and they manage to mix them quite well for the most part. I'd love to see them focus their sound and hone their songwriting for the next album; the playing and textures are firmly in place now. When both the album and the band are titled "Om," you should have a pretty good idea of what you're in for. These folks from France search for that infinite sound with a variety of percussive instruments- specifically ones that make chiming sounds. I think there might be a touch of chanting in the background too, but that may very well be overtones from the plethora of bells. As long as bells don't give you a headache, you should be able to enjoyably trance away with your new Fremch friends in Om (In full disclosure, bells do give me a headache; that's my excuse for not playing with my parents' bell choir). The album is structure in a similar manner to some of the more tripped-out krautrock concoctions. First off is "Sons Silence," which slowly builds from strikes on a woodblock, to having your head stuck in a super-sized wind chime on a breezy day. This is in contrast to "Paysages D'Ames," the third track, which starts with having your head stuck in a wind chime on a breezy day and builds to having your head stuck in a wind chime during a particularly rhythmic windstorm. "Ombres," the shorter track in between, would be more like a calm day with a couple plops of rain. I'm not sure if I'm selling this one too well, but I do think it's mildly enjoyable. I feel a little guilty that Cosmic Michael in the previous post seems to have put in a lot of effort, and these folks seem to be falling over on chimes, yet I consider this to be the superior recording by far. For those of you desiring to explore the sound of 'om,' this should serve as an integral research tool as long as you can deal with the constant ringing. Cosmic Michael seems to have been a shambling, hippy mess. Fortunately that sort of thing gets our attention here at the psychedelic garage. The music here is far from genius, but it does give us a window into the late 60's scene that a more masterful work would most likely transcend. Cosmic Michael takes us down into the trenches with barely competent playing and compositions that would be most at home in an exploitation film. No this doesn't deserve any sort of legitimate recommendation, but there's a charm factor at play here that makes it worth digging out from the past. 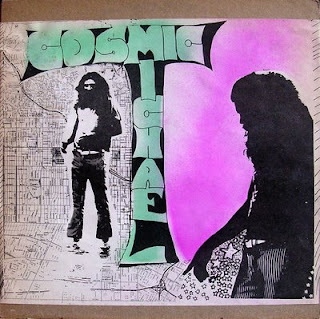 Cosmic Michael's music is another one of those things that I could easily imagine in the psychedelic coffee house set of a Herschel Gordon Lewis film (if that name doesn't ring a bell, I highly suggest googling it). We have a drummer that basically just keeps a beat, barrelhouse piano, cheeseball organ, and groovy basslines. The vocalist (the cosmic one himself?) is far from actually being good, but he does sing with an infectious conviction. I find that the songs are best the farther the band stays away from the blues, or at leasts manages some sonic weirdness on top of a blues structure. Amateur hour psych plays much better than amateur hour blues and boogie in my opinion. Due to the quality level, there aren't really much in the way of standout tracks. "Now That I Found It," which starts off the album, gives you a pretty good idea what you're in for. Of course we can't ignore that track three is Cosmic Michael's personal theme song, and it is the keeper from this collection. It also would fit best opening the aforementioned exploitation film. Does anyone know if such film in fact exists? I'd say that Cosmic Michael is probably best suited to hard-core psych junkies. Those folks will likely appreciate the charm flowing through this albums grooves. The quality here is not too good and should in no one represent the best of what psychedelic music has to offer. Let's face it, my complements for this album are pretty back handed at best. The complaints about superstardom in the lyrics of "Too Much" are extreme wishful thinking, if not hysterically ironic.